Madison County Joins Woodbury in Lifting Weapons Ban! As we told you last week, Woodbury County recently voted to lift their “Gun Free Zone” policies in accordance with the new Iowa code which took effect this past weekend. Throughout that 90 minute discussion, those who were testifying in support of violating Iowa law and maintaining the weapons ban made much of the fact that they were unaware of any other county who was trying to do this. 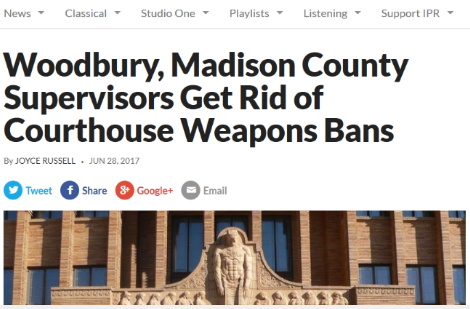 I’m pleased to inform you that Madison County has joined Woodbury in doing away with their previous policy that banned weapons in the courthouse — and we’re hearing that other counties are debating doing the same thing! And in case you’ve forgotten, it was in a courtroom in Madison County a few years ago, that a suspect pulled a firearm in the courthouse during his sentencing conviction. And while he did not shoot anyone, that situation could have provided the County Supervisors with political cover as they tried to maintain their previous policy. With Woodbury and Madison County having taken the steps necessary to comply with Iowa code and do away with their “Gun Free Zone” policies, it’s important that gun owners make sure their county supervisors do the same thing! As we stated in our email on this last week (Hotlink), your supervisors are not being asked to take a stand on the Second Amendment. To be blunt, their feelings on this subject don’t matter either way. Iowa code section 724.28 makes it blatantly illegal for any political subdivision in Iowa to pass gun control that is more restrictive than state code — you are simply urging them to follow the law. And don’t forget, just because the Iowa State Supreme Court is trying to claim the authority to ban guns in the all county courthouses is in Iowa, the Iowa Constitution makes it clear in Art. 3, Sec. 1 that only the legislature has the authority to make law. So while the State Supreme Court has the constitutional authority to ban firearms in the courtroom, something that virtually every gun owner agrees with anyway, this attempt to make the entire building a ‘Gun Free Zone’ is unconstitutional and therefore illegal. Don’t let your county supervisors try to hide behind this opinion piece as grounds for their inaction! Simply remind them that the legislature and the governor have already enacted this new law and that their job is simply to follow it and modify county policies in light of it — just like their colleagues in Woodbury County and Madison County have done. Gun owners worked too hard last fall securing a pro-gun majority last (not to mention keeping the pressure up on the legislature this session) and passing the largest gun bill in Iowa history, only to see upset and unelected judges try to undo it all. That’s why I hope you’ll take a moment to contact your county supervisors today. Please also take a moment to forward this email to all of your pro-gun friends, and make sure they do the same thing! And, if you can, please consider joining Iowa Gun Owners! During the month of July, all new (or renewing) members will receive a FREE T-Shirt and membership decal! P.S. Late last week, the Madison County Board of Supervisors joined their colleagues in Woodbury County by rescinding their previous ‘Gun Free Zone’ policies on county property! Please take a moment to contact your county supervisors today and insist that they comply with Iowa’s new preemption law, 724.28, which took effect last weekend! Make sure your friends do the same thing as well, by forwarding this email to them. Also, if you haven’t already done so, please join or renew your support in Iowa Gun Owners right away, as all new or renewing memberships in the month of July come with a FREE T-shirt and membership decal!! Happy Independence Day from Iowa Gun Owners! Rep. Baudler Files Bogus Charges Against Iowa Gun Owners!